Vanity tops are more than sinks and countertops; they’re a vital workspace that brings a bathroom together. 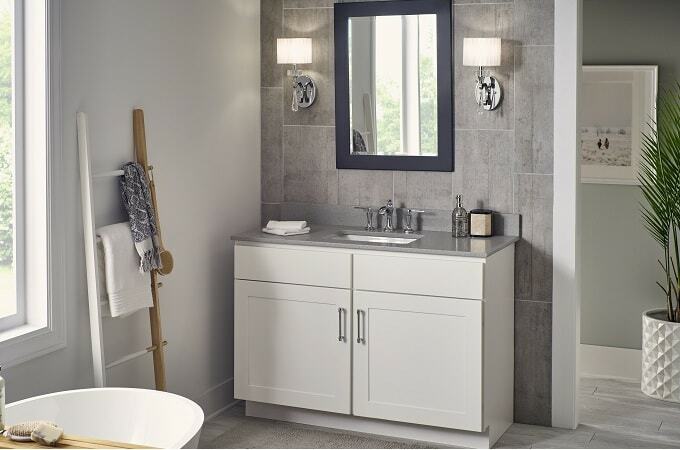 From solid surface and quartz to cultured marble and natural granite vanity tops, Wolf vanity tops offer the styles and selection to complete your bath with flawless function and beauty. When you take the time to pick out the perfect vanity top that fits your unique tastes and style, it can turn a simple bathroom into an oasis you can enjoy for years to come. 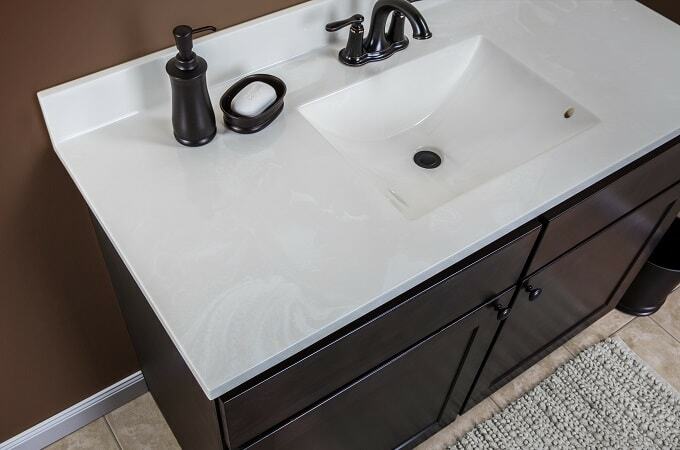 From solid surface and quartz to cultured marble and natural granite, see why Wolf's vanity tops are the perfect fit for your bathroom renovation. A non-porous surface that is moisture, bacteria and stain resistant to provide a seamless look, no matter how large the space. 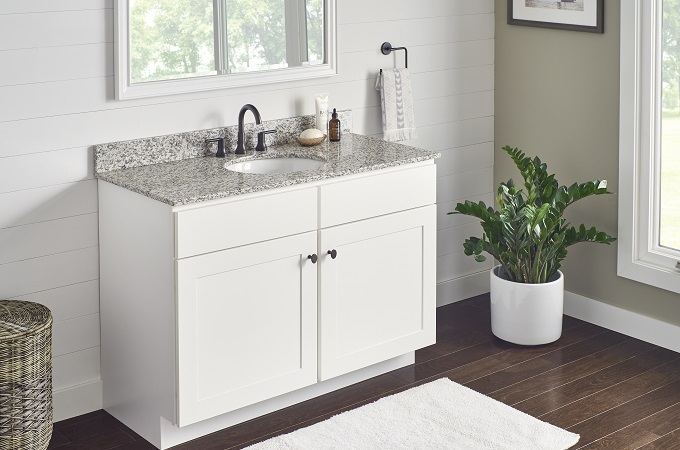 With a simple, beautiful solid surface vanity top, you may choose to create a minimalistic, clutter-free design or to add other personal touches to your bathroom. Either way, Wolf Solid Surface vanity tops are easy to maintain, giving you more time to do the things you love. Classic beauty and practicality that is resistant to stains and moisture, surprisingly affordable, extremely durable, and easy to maintain. With a Wolf Quartz vanity top, you can enjoy all the beauty of natural-looking, low maintenance quartz stone in a variety of finishes. From our large selection, you can select the perfect quartz vanity countertop to create a unique decor of your bathroom. And with a high-quality Wolf top, you’ll enjoy your new look for many years. The hardest of all natural stone materials, Natural Granite fits any decor from classic to contemporary and resists stains, scratches, and heat. This vanity top material gives your bathroom a high-end feel without the high-end prices. A Natural Granite vanity top will give your bathroom the updated feel you're looking for, making your bathroom both a functional and visually stunning space in your home. Smooth, seamless lines with first-quality construction, beautiful colors, and the most popular bowl sizes. Choose from a wide selection of unique and dazzling finishes to find the perfect fit for your bathroom. With special order and quick ship options available, you can create your ideal space faster and more affordably than you might imagine. With so many options to choose from, finding the right vanity top can be difficult. At Wolf Home Products, we've made it easy to compare your options. When you shop Wolf Home Products, you will feel confident you're selecting a beautiful, high-quality addition for your home. Select styles deliver in days, not weeks. Whether you’re building a new home or renovating an existing space, Wolf Home Products’ Quick Ship selections help you get the work done quickly so you can get back to enjoying your space. Feel confident with an industry-leading 5-Year Limited Warranty. If something happens to your vanity top, we're here to make it right. With our 5-Year Limited Warranty, you can rest assured, knowing you're making a good decision to improve your home. Delays in a project can be costly and frustrating. When you shop Wolf Home Products, you'll receive the correct delivery the first time, or we'll make it right. If you're looking for inspiration, browse through our online gallery. You'll find lots of ways our beautiful vanity tops and other products can turn your house into your dream home.